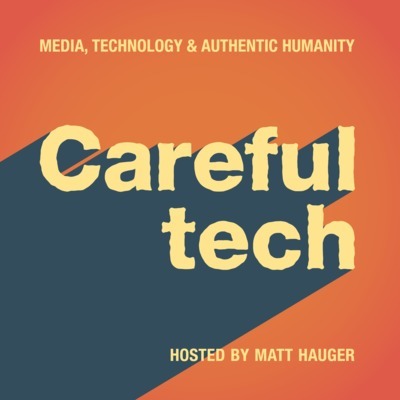 Reflections on media, technology and authentic humanity. Fresh every weekday. In terms of computing platforms, I‘ve been set adrift. As I played with the devices, I realized that the 11-inch iPad Pro makes compromises in all the wrong places. I’m bummed to miss out on the hotness, but here’s the thing: I can meet these “needs” without dropping $1,200 on an iPad Pro, a Smart Keyboard, and an Apple Pencil. It simply requires some creativity—and some willingness to compromise. The dearth of Apple Watch meditation apps may be a symptom of a deeper issue. I’m sympathetic to our ISP’s sorry state, and I’m rooting for them to pull out of their apparent death spiral. I’m even willing to pay a bit more to help them survive. I’d just rather see them hike their rates honestly, instead of slipping in a bogus charge and hoping that customers don’t ask questions. Adopting macOS wasn't quite what I expected—hardly the aesthetic epiphany promised in those old John Hodgman ads. 066: How much should Apple Watch cell service cost? Why not just pony up for the cellular model? It costs too much! I’d like to see the iPad Pro support external touchscreen displays—effectively turning a touch monitor into a giant iOS device. The quintessential modern etiquette dilemma. 062: Is checking luggage a life hack? By the time I've disembarked from the plane, stopped by the restroom, and found my assigned baggage claim area, my bag is often already there. AirPods have clearly broken through in a huge way—but you wouldn’t know that, walking around my neighborhood. Yes, I’d love a larger online audience, but would that really make me happier? Would strangers’ appreciation make me feel more loved or less isolated? My mad, late-night preorder dance, with a twist. 057: Why are America’s playgrounds deserted? Modern playgrounds are better than they’ve ever been. So what’s keeping the kids away? When I first cobbled together my treadmill desk back in 2014, building the desk itself wasn’t the hard part. The real trouble was my feet. If we’re honest with ourselves, it’s not the tools that hold us back from creating stuff on the internet. The real obstacles to creative productivity? Low motivation and overcommitment. 054: Apple ditching 3D Touch? Good riddance. If Apple ditches pressure sensitivity in the iPhone, I won’t mind. I’ve owned AirPods since soon after their release in late 2016. After a year and a half of daily use, I recorded some thoughts. Many observers scoffed at the billion-dollar price that Facebook paid for Instagram. Who’s laughing now? 050: Does a treadmill desk make losing weight easier? If I eat irresponsibly, I gain weight—no matter how far I walk. 049: Is it too late to switch to the Mac? After a quarter-century using Windows, I'm finally getting a Macintosh. Did I wait too long? What would happen if you recorded a podcast WHILE running? Let's find out! A few years ago, I surrendered any right to sneer at eager Black Friday shoppers. I’m betting on my own ability to prevent iPhone catastrophes. My sleep-tracking app is surprisingly accurate, and I enjoy peeking at the trend lines every once in a while. But I don’t actually do much with all that data. Publishing something imperfect, let alone something that's genuinely bad, is difficult for me. Even if the Portrait mode algorithms improve, I'd like to see some support for touching up problematic depth maps. Football is irredeemably brutal. A new test may help us confront that fact. The internet has fundamentally changed my relationship to content. I won't go back. For basic home operations, rock-solid reliability is the only feature that matters. I grew up shopping in dingy, cavernous, fluorescent-lit warehouses. But Apple outlets resemble high-end, big-city fashion boutiques, more than they do those Rust Belt K-Marts of my youth. I want the Watch to show up as a system-wide audio target any time it's connected to the phone—just like standalone Bluetooth speakers and headphones do. Users shouldn’t blame third-party for the Watch’s podcast unfriendliness. The real issue here? In the two-and-a-half years since the Watch first launched, Apple has dropped the ball on podcast support. A device as expensive as the iPhone X serves as a negative status symbol in some circles. When I stop delighting in the work for its own sake, I soon stop working altogether. When I let website analytics or podcast download stats serve as my primary motivation, discouragement festers, and I soon stop writing. It’s happened a half-dozen times before. As I tally the hours, I'm struck by how much of my life is spent using gadgets. On Friday afternoon, UPS dropped off a new toy. My thoughts after a weekend with the iPhone X. How do your media habits compare to the average American's? Clicking ‘read later’ isn’t about bookmarking great content. Rather, it’s my way of ignoring how little great content I actually read. The vlogger probably wasn't aiming to gain YouTube subscribers by sacrificing her father's job. But that's what happened. The “Apple access economy” incentivizes problematic journalism. Some future iPhone will inevitably ditch all ports and buttons, leaving only the touchscreen accessible to the end user. It will be beautiful, glossy—and permanently sealed. Anecdotally, buying the X felt no different than previous iPhone preorder nights. In fact, it might have been the easiest preorder purchase I've ever made. Funnily enough, the internet service gets worse as the hotel gets nicer. The “Breathe” animation on the Apple Watch has an annoying little hiccup. Once you see it, you can't unsee it. Why had Uber drivers given me bad ratings? I had thought I was a model rider. The move away from shared screens on flights isn't welcome for those who struggle with tech. Despite the crisis in web publishing, and despite publishers' increasingly desperate pleas, I don't feel guilty enough to turn off my ad blocker. Yes, accelerating playback may save you time, but it also has nasty side effects better left avoided. How Jerry Seinfeld’s productivity mantra inspires me to blog and podcast daily. Tech brand loyalty is a malfunction of our tribal programming, and it works against our own best interests. Tech distraction suppresses our agency, deadens our compassion, dulls our consciousness, and drowns out our sense of purpose. When distracted by our gadgets, we stop pursuing noble causes and instead squirrel away hours, chasing red badges and refreshed timelines. The election has thrown American society into slow-motion shock. The tech industry continues to convulse, too. If I buy an iPhone X, I'll justify the $1,000+ price tag by pointing to its killer camera. Quitting Facebook is hard. But a few simple steps made deleting my account feel anticlimactic. Although it’s painful for a Twitter “completionist”, Twitter bankruptcy is good for the soul. When I ignore my desire for affirmation and appreciation and instead simply focus on expressing something genuine, blogging and podcasting are much more fun. The world’s most dominant technology firm doesn’t need an army of apologists, patrolling the Internet for proof that Apple was right. Facebook isn’t just “sticky” from a relationship perspective. There are also some practical annoyances that make it difficult to resist the blue behemoth. The iPhone X’s $1,000 price tag isn’t quite so hard to swallow when you consider the standalone gadgets that the device renders unnecessary. If our devices can encourage exercise and meditation habits, why shouldn’t they encourage polite social habits, as well? It’s not difficult to imagine the iPhone being “eaten alive,” its role absorbed by devices at either end of the size spectrum: the iPad on the large side, the Watch on the small. 005: A Long Sentence, or a Short Paragraph? Last night, Twitter began public testing of a long-rumored, controversial increase to its character limit, doubling the quota from 140 characters to 280. It’s the most significant change to the service since its debut over a decade ago—the difference between a quip and a quote, between a thought and an idea, between an objection and an argument. What can other House of Cards and the Handmaid’s Tale tell us about Apple’s prospects in streaming video? The best Apple Watch Series 3 review wasn’t written by a tech journalist but by a watch nerd.